​"If You Want to Be a Hero, You Need to Have Dreams." To SOLDIER 1st Class Zack Fair of Crisis Core: Final Fantasy VII, this phrase, this motto of his, became his modus operandi. His whole life revolved around pursuing his dreams with all his heart, and defending his honor. And for some reason, after all the times I’ve played through that game and talked about it, and watched its cut scenes like a movie, it is only just now affecting me on a truly personal level. Those words, for a reason that was at first quite befuddling, struck a chord within me that was so powerful, I actually had to stop everything I was doing and simply stop and reflect for a while. My friend Z and I frequently get into discussions about broad, gaming-oriented, philosophical discussions, talking about storytelling, mechanics, implications, characters and their flaws, etc., not entirely unlike Extra Credits, Sequelitis, or AVGN. We were talking of Mario and his personality, and then we talked of Luigi, Z’s favorite character of all time, with whom he relates very closely. So I asked Z right then to take a stab in the dark and guess which character I related to the most. Zero. Megaman. Jabba the Hutt. The first two were on the right track. So, close... -ish. Vile, Sigma, Black (or I guess yellow) Devil? I didn’t mean MegaMan specifically, dumbo. Uh, badeblade guy. Dumbo. Crows from Dumbo. Beyblade*, his name is Kai, and no. To be honest, it was actually a bit of a trick question. I’ll be honest, my answer was a bit of a cop-out. I suppose you could say he was at least partially right. Ooooh, all of those... pffft. Figures. That’s cheating. Some of them were gifted with incredible talents and skills. Some of them were cursed with things they didn’t know how to control, things forced upon them. Others had to go through unfathomable amounts of suffering and torment, mental, emotional, physical, and otherwise. They all have one main thing in common though. They are fighters. They fight for their hopes, for their dreams, for their love, for their freedom. They fight not because they want to, not even because they’re good at it, but because they have to. And they come out all the stronger and wiser from it. I have learnt lessons from standing in the shoes of every one of these characters, and I have taken those lessons to heart, and my life is now better than it’s ever been before, and I thank them for it. Way to sap things up (not that I’m one to talk), but I guess that is the point of a hero. I identify with every single quality I just listed. I was gifted with incredible talents and skills (my intelligence and intuition, as a result of my having Asperger’s Syndrome). Asperger’s isn’t all good though, and thus I felt for a long time as though I was cursed (social and emotional ineptitude and an untameable wandering mind and a distracting hyper focus too strong to fight, obsession over ideas, things, or worst of all people). Suffering and torment, through my own psychological fears and self-imposed weaknesses and phobias and limitations, emotional stress from being bullied, or the inability to comprehend nor properly deal with romantic emotion, quite tormenting that. Physical... I won’t go there, that’s its own story. I am a fighter. I fought bullies. I fought ignorant teachers. I fought parents and ‘friends’ who I thought didn’t or wouldn’t understand. I fought myself. I fought monsters, virtual and imaginary. I fought the system. I fought to understand myself, to find out what I wanted, and who I wanted to become. And then I fought to do it. I fought for my own freedom. Freedom from the limitations I put upon myself, free from the limitations of a system that says I have to do things their way. I only do what I want, because I can, because I want to, and for no other reason. I was inspired to fight to take control of my life by my heroes. In our world, every storm has an end. Every night brings a new day. What’s important is to trust those you love, and never give up. We must never give up hope! Zero was an incredibly skilled warrior who fought for justice, and destroyed those who would cause chaos and bring imbalance to the peace and happiness everyone else strived to attain. He didn’t have to earn those skills, and he almost took them for granted. He was just good, and he knew it, and everyone knew it, and that was it. He fought for freedom and justice and equality and balance in MMZ, as well. Simon was a scared little kid who was taught by his bro Kamina to believe in himself, and in his friends, and in his hopes and dreams. He was taught to always reach higher and higher, to never give in to hopelessness, to kick logic to the curb and do the impossible. He was taught to fight through things that would topple the strongest of individuals. Time and time again, sheer fighting spirit got them though the thick of it. But he was not taught all of this by one person. He was taught this through his own trials, through his own struggles. He was taught through the experiences he went through with all of his friends, against the forces that would hold him back. Simon is my best friend, and the outward manifestation of my soul. “We evolve, beyond the person we were a minute before! Little by little, we advance a bit further with each turn! That’s how a drill works! Mark my words... This drill... will open a hole in the universe. And that hole will be a path for those behind us. The dreams of those who have fallen... the hopes of those who will follow! Those two sets of dreams weave together into a mighty double helix, drilling a path towards tomorrow! And THAT’S Tengen Toppa! THAT’S GURREN LAGANN! Ryuko fought for answers. She fought to the end to set things right. She sought answers and vengeance. Though even after discovering truths both amazing and horrible, she didn’t let anything slow her down or deter her focus from the things she knew she had to accomplish. She overcame her trials with determination and willpower, with focus and strength. There were times when she lost sight of her aim, when she became possessed by rage, bloodlust, and vengeance. It wasn’t until she reclaimed her focus on what really mattered that she then understood that her strength did not simply come from herself, but from her closest friends as well. It was then that she was able to conquer her challenges. Through pain and loss and the death and the destruction of his home and his family and the entire world he grew up knowing, Eren fought for freedom from oppression, oppression from a force he could barely understand. His whole life he just wanted to escape the torment of being trapped like livestock, to find out what was out there in the world, to be free to live without the fear of death, or worse: spending an eternity cowering in a meaningless existence behind ominous walls. So instead of sitting by like the vast majority of the people he saw, Eren took matters into his own hands, and joined the military to exact vengeance and pursue his ultimate goal of liberating himself and all humanity. His pure passion and hope for the freedom that exists outside the walls drove him to keep getting up, no matter how many times he was knocked down or even gravely wounded. Do you know what it’s like to be bullied? I sure do. So does my pal Naruto. He was hated and looked down upon, shunned, and despised. Naruto had to fight to prove himself. Through everything he endured, he inspired others, and brought about unity. Naruto is nothing but a bundle of joy, love, and acceptance of others. He was rejected for so long, but didn’t let it get to him. He didn’t do what Gaara did, and what I kind of did, and shut everyone out. He opened up to let anyone in who would dare to love back. He fought for his friends and for the things he believed in. He fought for his dream to rise to the top, improve himself, and become the person he always wanted to be. Naruto’s life has been one quite similar to mine, and I admire him greatly for the way he overcame his struggles. Now that the series has come to a close, without a doubt I feel a kinship with Naruto that runs deeper than with most of my own family. His whole life parallels mine in such meaningful ways it’s almost uncanny. It’s almost unbearable, isn’t it… the pain of being all alone. I know that feeling, I’ve been there, in that dark and lonely place, but now there are others, other people who mean a lot to me. I care more about them than I do myself, and I won’t let anyone hurt them. That’s why I’ll never give up, I will stop you, even if I have to kill you! They saved me from myself, they rescued me from my loneliness, they were the first to accept me as who I am. They’re my friends. My dream is to become the greatest Hokage, that way the whole village will stop disrespecting me and treat me like I’m somebody, somebody important. If you don’t like your destiny, don’t accept it. Instead, have the courage to change it the way you want it to be...! Goku fights for his family, for his friends, for freedom, justice, and peace. Goku does nothing but work hard and improve, and fight no matter how bleak things look. When he loses, he takes it in as a learning experience, and betters himself for it. That’s basically it. Who doesn’t want to be like Goku? LOSERS, that’s who! I am the hope of the Universe. I am the answer to all living things who cry out for peace. I am protector of the innocent. I am the light in the darkness. I am truth... ally to good, and nightmare to you! S/he could have an emotionally and mentally scarring past, where his/her family was killed by slavers, or s/he could have grown up in the slums as an orphan, or s/he might have had the easy life being raised by military parents in space. After joining the military, Shepard might have been the lone survivor from a tragic attack on his/her squadron. Or s/he might have just learned to be a ruthless military commander, ends-justify-the-means, get-the-job-done-no-matter-what kind of deal. Or s/he might have been heralded a war hero, saving countless lives through intuition and bravery like no other. No matter his/her background, Shepard goes on to be a leader and inspiring friend like no other. Commander Shepard fights to protect everything, and s/he fights for freedom. We have to give everything, even if that means our lives. Each of you needs to be willing to die. Anything less...and you’re already dead. We will stop at nothing. We will fight for the lost. This war’s brought us pain, and suffering, and loss. But it’s also brought us together, as soldiers, allies... friends. This bond that ties us together is something that the Reapers will never understand. It’s more powerful than any weapon, stronger than any ship. It can’t be taken or destroyed. The next few hours will decide the fate of everyone in the galaxy. Every mother. Every son. Every unborn child. They’re trusting you. Depending on you to win them their future. A future free from the threat of the Reapers! Take heart! Look around you! You’re not in this fight alone. We face our enemy together, and together, we will defeat them! He’s a Hero alright, though not always simply because of a goddess-given destiny. As is seen most especially in the Wind Waker, Link almost always has to prove himself worthy to be called a Hero, by demonstrating his courage in extremely difficult situations, under unfathomable amounts of pressure to get things done right, and in time to save the world. He is always incredibly skilled, but as we see in Wind Waker, Skyward Sword, and Twilight Princess at least, Link had to learn and earn it. He trained or went to school for years to become a warrior. He has always had a talent for it, he’s quite the natural, but nonetheless it was not simply a gift, not in all cases. Link then of course has always used his acquired skills to better the world and to fight to save those he cares for. This everyman, the link between the player and the game, has certainly made me feel quite connected. I tend to always think of myself as Link, instead of as Link being a separate character that I happen to be controlling. Link serves as a bit of wish-fulfillment, allowing for the actual acting out of being a classic hero, making me feel smart, strong, and brave as I play. Because of this, those qualities are inspired from deeper within myself, and I realize I have the potential to be just as smart, strong, and brave as he is. Lightning fights because she has to. Lightning is a reluctant and capable soldier who became as such to protect her family. She isn’t really a hero, and though she was put into insane positions to help people and pull off normally impossible things, she just dealt with it. She took her curse/gift and instead of whining and giving up like some others wanted to do, she took it and used it to accomplish her goals. She became a hero simply through her actions, because she ~took~ action when no one else would. Control your emotions. If you want to survive you forget about sympathy. Think of it like a strategy- focus on your ultimate goal, shut out everything else, steel your mind, move on instinct. Let doubt take over and despair will cripple you. It’s not a question of can or can’t. There are some things in life you just do. We live to make the impossible possible! That is our focus! 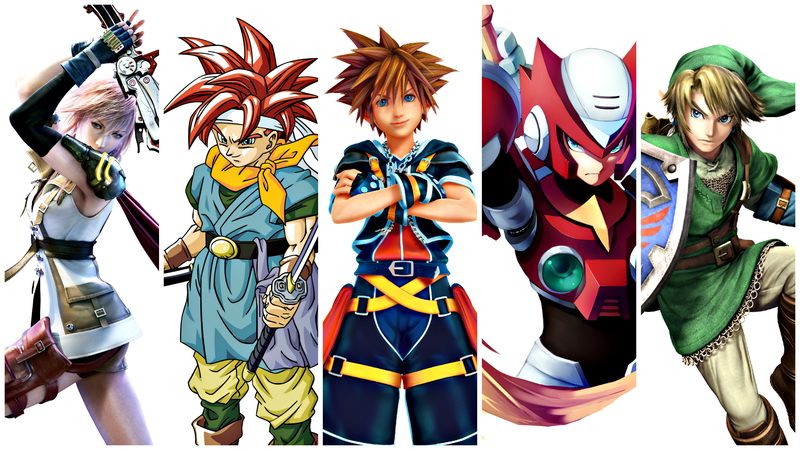 Sora fought for his friends, and followed his heart in all that he did. He never looked back, and always saw the bright side of things. He’s always an optimist and a fun, likable dude who took his gift and, instead of being afraid or neglectful of it, embraced it and answered the call with great vim and vigor. He had trust in his friends. There was a time when he lost faith, and couldn’t even trust himself. But once realizing that he didn’t have to do things alone, that he was actually at his strongest when working together, he was unstoppable. He did all that he was asked and more, and then fought on because he wanted to. Not once did he have a single selfish thought. And of course, lastly, and most certainly not least, we have the ever so spiky-haired Zack Fair. I honestly don’t even know where to begin with him. Zack has been nothing but inspiration to me since his center-stage debut in 2008, when I was in middle school. I honestly think that Jirard “That One Video Gamer” Khalil, The Completionist, talks about him and part of his significance better than I do. And really, his actions say enough as is. Please, if you don’t mind the spoilers, take just a minute or two and watch this video from 25:30 onward, and watch Zack embody everything I’ve been talking about. Embrace your dreams. And, whatever happens, protect your honor. Zack Fair died for his dreams, to protect his home, his honor, his loved ones. His was the ultimate sacrifice. None could ask for a more honorable death. I love video games. I love technology, and space, math, science, knowledge, truth, and learning. I love growing and changing. I love improving myself, and teaching, and helping others to learn and improve their own lives. I love living, and life, and all parts of it. Even the terribleness to be found in humanity’s twisted core. The world is in perfect disarray. In its imbalance, it is perfectly balanced. There can be no light without darkness, nor dark without light. Without hate, we would not know love. Without knowledge, we would not know ignorance. Without despair, we would not know hope. Without sorrow, we would not know joy. Without pain, we would not know bliss. I have known a great deal of pain, ignorance, despair, sorrow, hatred, and darkness in my life. It is because of this that I now appreciate the light and love in my life moreso than I ever did before. I am a fighter, and I know I’m probably someone’s hero. And so are you. I fight to be free. I fight for love, and for truth, and justice, and all sorts of cheesy things. But it’s nonetheless true. Like Zack Fair of Final Fantasy VII, I dream of becoming a hero. But to be a hero, you need to have dreams. I have plenty of dreams: I dream of becoming a father and raising a happy family; I have a dream to own an ideal home, and to own a great many more material things; I dream of humanity’s ascendance to the stars, to finally reach out and embrace the universe in its magnitude, like I do; I wish to become a programmer, and more specifically, to be a game designer and developer, to tell stories and express lessons and ideas that I couldn’t do in any other way. I know who I am. I know who I want to be. I know what I want to do, and how to do it. Do you? Do you have dreams?